This custom board was built for return customer Kirt who has a penchant for geometric color designs and fast single-fin longboards. 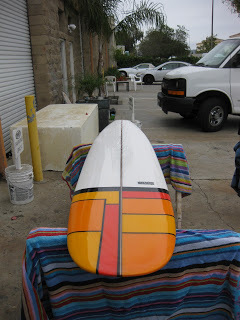 The board’s dims: 8-8 18″ x 22-3/8″ x 14-5/8″ 3-1/8″. The rails are pinched 50/50 with a hard edge in the last 16″ of the tail. Bottom features subtle nose concave with “V” in the tail. Laminated wood tailblock punctuates the cedar/basswood T-band stringer. Color work by Ray Lucke is a combination of air-spray and black resin stripes.